I so paid attention disregard the post below. Last time, we asked for your comments, and PEOPLE COMMENTED. Whoa. You guys made us so happy that we won’t ask again for a while! Thank you so much! I love you all! Have you ever eaten beets? It’s like someone marinated beets in cold medicine. And THAT’S why we can’t solve world hunger with magic. I DID notice the trees! Also I mentioned this in a comment a few pages ago, but forgot to ask why, so … Why does your main character have 4 eyebrows? It’s really cool, but how did you think of that? And for reasons I cannot comprehend, HE LET ME GET AWAY WITH IT. …And then we ACTUALLY WORKED IT INTO THE STORY. But you’ll have to wait a while for more on that. I’m partial to think that Lord Skarva is just feeding her lies about magic. Hahaha. Well, in all honest truth, magic in this world is really just a channel of your inner energy. So if you’re hungry, you really can’t do it as well. You can do, say, bush transformation (or turning yourself into a saucy wench, I suppose), but not really powerful offensive magic. (Don’t even speak to me about transmogrification magic being rather complex. Shh.) And performing magic actually does use up your energy, making you hungrier again. Exactly. Those sound anything but delicious. Unless you’re a vampire, or… someone who likes to eat metal. You are the coolest! <3 See you around! The last panel made me almost spit-take. There’s something hilarious to me about Skarva’s lines there. I so want a “magic food tastes horrible” Skarva avatar. I’m glad, but I’m also glad you didn’t actually spit-take, ’cause no one wants a sticky keyboard. We’ll update the avatars periodically. Until then, if you want, you totally have my permission to make it on your own. Hehehe, thank you. I love him too – I love all of them. I can’t pick favorites; they’re like my children. Well I just stumbled across this and must say it seems to be quite good so far. The milkshake must be chocolate. Nothing else could give such power. Yeah, I know Victor would agree – he is a chocolate FIEND. And since he has declared himself the official master of this comic’s canon, well, you must be right. If you’re a hero who doesn’t like chocolate, you’re sore out of luck. …Also if you’re lactose intolerant. DANGIT! 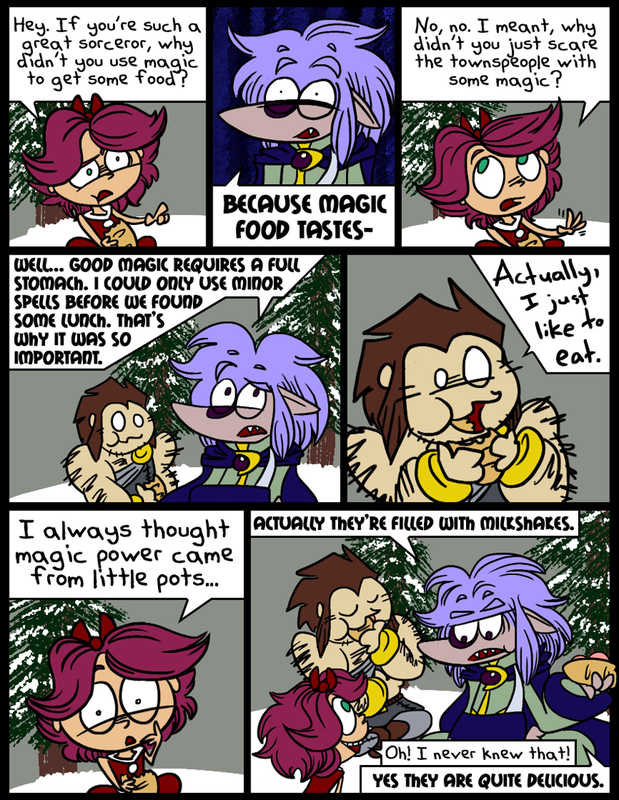 I can’t believe I watched this comic for so long without making a “Blue Wizard needs food badly” joke! It would have been perfect!! This really was an earth shattering truth, now we know why Skarva was having Derk carry two huge bags of picnic supplies..of doom! But if you are lactose intolerant, they are filled with whiskey. Same effect, but over a shorter period of time. Milkshakes and booze. No wonder so many little boys aspire to be heroes.